Craft breweries are taking off all across the country—and Northern Indiana is no exception. Around the region, you’ll find fun and funky breweries that are putting their unique spin on this frothy favorite. Whether you’re searching for one awesome spot to grab a beverage and a bite, or want to create a tasting tour across Northern Indiana, these ten breweries will definitely hit the spot. 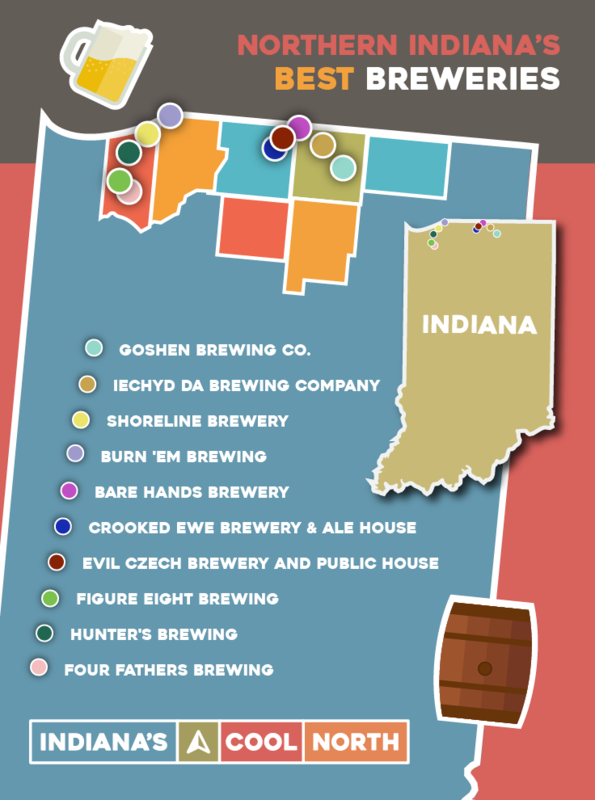 Goshen is one of Northern Indiana’s most up-and-coming small towns, making Goshen Brewing Co. a perfect fit for its vibrant downtown. Located in a former power station just two blocks from Main Street, try a selection from the rotating tap list featuring barrel-aged ales, sours, and brews. Local ingredients–like strawberries from Yoder’s–are often highlighted. And the local focus doesn’t stop there. The brewery has a delicious farm-to-table menu, including options for children and a fantastic Sunday brunch selection. The name might seem like a mouthful, but is easily mastered after a pint or two. Meaning “good health” in Welsh, this downtown Elkhart brewery’s name is pronounced “Yah-key-Dah”. From handcrafted lagers and ales, to tasty pizzas and sandwiches, almost everything at Iechyd Da is made in-house. Evidence of owner Chip Lewis’ Welsh heritage can be found everywhere you look, from the names of menu items to pint glasses emblazoned with dragons. Most beer on tap leans toward the session or English style, but there are plenty of others to sample. Try El Conquistador Mexican Lager, Breakfast Cookies Stout, Boxcar Brown Ale, and many more. Not for the faint of heart, Burn ‘Em Brewing’s motto is “Comforting the disturbed and disturbing the comfortable.” The cozy taproom is definitely unique, adorned with comic-book style skull artwork—which you’ll also find on their eye-catching beer labels. Have you ever had a creamed corn ale? Or one made with graham crackers? If you’re feeling adventurous these experimental brews are certainly worth sampling. You can also chow down on a rotating food menu with ingredients sourced from local vendors and listen to the smooth sounds of vinyl records every Tuesday night. A relaxed, family-friendly atmosphere makes Shoreline Brewery the perfect pit stop after a day of exploring Michigan City. The brewery is just across the street from Lighthouse Place Premium Outlets, and a short walk from Washington Park Zoo. Choose from twelve taps worth of beer, as well as a selection of barrel-aged brews that any craft beer connoisseur will love. The eclectic menu at Shoreline is globally inspired, and a far cry from plain old pub food. A wide selection of bar snacks and small plates like Veracruz fish tacos are great for a quick bite, and more substantial mains like Grecian chicken with artichoke orzo will fill up up so you can sample suds to your heart’s content. One of Northern Indiana’s best kept beer secrets, Bare Hands has a simple mission: handcraft small batches of incredible beer with the highest quality ingredients. They’re so exclusive in fact that they only sell their creations in Indiana, so you’ll have to get yourself here to try them! Known for having a cult following among what they call “beer geeks” some of Bare Hands most popular beers include Mail Order Bride (Russian imperial stout), Galaxy Imperial (double IPA), and Cream Ale (classic cream brewed with two-row barley). Just across the St. Joseph River from the South Bend Farmers’ Market, Crooked Ewe is a favorite among locals for their specialty brews like Murder by Death Bourbon Barrel Aged Imperial Stout. Veggies, vegans and carnivores can all find something to savor on the menu with everything from smoked brisket to vegan poutine. Seating is only available for the 21 and over crowd right now, but a family-friendly second floor with rooftop seating is in the works. This is definitely one place every beer lover should “Czech out” in Mishawaka. Keep it classic with O’Keeffe’s Irish Red, sip something smooth with Voodoo Vanilla Rye Porter, or up the ante with Serious IPA, which clocks in at 8.5% ABV. Their menu is extensive, and seriously delicious. Sample it all during Lightnin’ Lunch—a small plate lunch buffet when the entire regular menu is served up in bite-size form. If you believe life is too short to drink bad beer, you’ll be in good company at Evil Czech Brewery. Former engineer and avid rock climber Tom Uban founded Figure Eight Brewing on a simple philosophy: If you brew it (well), they will come—and do they ever! In addition to 30 seasonal offerings and 6 year-round brews, Figure Eight also serves up limited releases of bourbon barrel-aged beers that spend a year soaking up oaky goodness. Hop heads will rejoice over the favorite Where Lizards Dare IPA. Bring your appetite and build your own burger from the extensive menu, or choose from bar bites, pastas, flatbreads and more. Running the gamut from traditional to creative, Hunter’s Brewing in Chesterton is a nanobrewery that creates small-batch brews by hand using a one-barrel system. If you’re on the hunt for for a truly boutique beer experience, you’ll find it here. Try the Octavius smoked English Ale or keep it fresh with the Steel Town Girl saison. For a meal that won’t weigh you down, choose from their vegetarian and vegan menu featuring homemade sandwiches and snacks. Like the country’s founding fathers, the folks at Four Fathers Brewing have some revolutionary ideas when it comes to brewing. Step inside the 30 seat taproom and be surrounded by dark, knotty pine, hand-selected items of Americana, and the much cherished Wall of Honor, featuring photos of those who have bravely served our country. Try their Why Buy the Cow? milk stout brewed in collaboration with Dagger Mountain Roastery, or turn it up a notch with their To Eleven gose. Ready to sip and sample your way through Indiana’s Cool North? 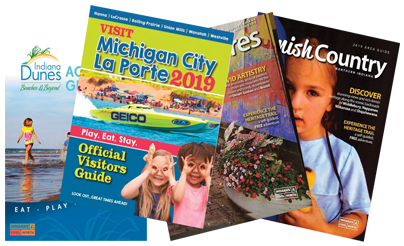 Explore even more things to see and do in Northern Indiana here.